Wolenkomi (Ethiopia) (AFP) - Two lifeless bodies lay on the ground as the terrified crowd, armed only with sticks against gun-toting Ethiopian security forces, fled the fierce crackdown on protesters. "That was my only son," a woman sobbed. "They have killed me." Back at the family home of 20-year-old Kumsa Tafa, his younger sister Ababetch shook as she spoke. "He was a student. No one was violent. I do not understand why he is dead," she said. 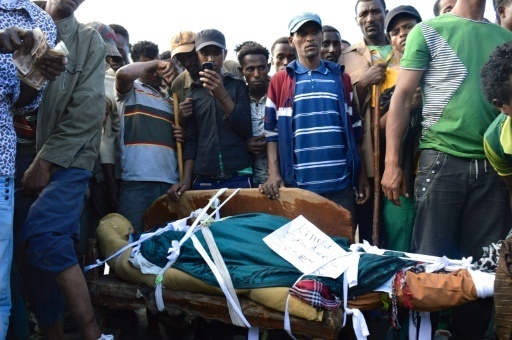 Human Rights Watch says at least 75 people have been killed in a bloody crackdown on protests by the Oromo people, Ethiopia's largest ethnic group. The demonstrations have spread to several towns since November, when students spoke out against plans to expand the capital into Oromia territory -- a move the Oromo consider a land grab. The sight of the protesters on the streets of towns like Wolenkomi -- shouting "Stop the killings! This isn't democracy!" -- is rare in a country with little tolerance for expressions of discontent with the government. "My husband just called me," said a woman clutching her phone, as others screamed and children burst into tears. "He's taking refuge in a church. Police shot at the protesters," she said. The man next to her cried in despair: "They're taking our land, killing our children. Why don't they just kill everyone now?" "They grabbed me by the face and they told me, 'Go home! If you come back here, we'll kill you'," said Kafani, a shopkeeper. Rights groups have repeatedly criticised Ethiopia's use of anti-terrorism legislation to stifle peaceful dissent, with the US expressing concern over the recent crackdown and urging the government to employ restraint. But Prime Minister Hailemariam Desalegn declared on television that the government would act "without mercy in the fight against forces which are trying to destabilise the region." Oromo leaders have vowed to keep up their resistance against proposals to extend Addis, and Human Rights Watch has warned of "a rapidly rising risk of greater bloodshed". "The government can continue to send security forces and act with violence -- we will never give up," said Gerba. Land is at the heart of the problem. Under Ethiopia's constitution, all land belongs to the state, with owners legally considered tenants -- raising fears amongst the Oromo that a wave of dispossession is on its way. "For farmers in Oromia and elsewhere in the country, their land is everything," said Felix Horne, a researcher at Human Rights Watch. "It's critical for their food supply, for their identity, for their culture," he said. "You cannot displace someone from their land with no consultation and then inadequately compensate them and not expect there to be any response," Horne warned. "We had a good life before," she said. With their own language distinct from Ethiopia's official Amharic tongue, the 27 million Oromo make up nearly 30 percent of the country's population. "The Oromos are seen as more of a threat by the government in part because they are by far the largest ethnic group," said Horne. The proposed expansion of Addis is part of a 25-year development plan to boost the city's infrastructure and attract new investors.